The word brings to mind a calm assurance, an unwavering faith, and unchanging character. Steadfast is a gentle power complimented by humble quietness. A steadfast woman is a woman at peace. This is my desire, friends, to be a woman who is steadfast in heart, faithful to Jesus and to her family. I want to be the kind of steadfast woman who is Christ-confident rather than self-confident, who utilizes the gifts He’s given not for her own glory but for His glory. Last year the Lord kept bringing to mind the word Persevere, and if you follow along with this blog or the BCOT facebook page, then you know why I needed that word! We’ve been through a season of turmoil and change that still hasn’t quite settled. Yet in the midst of all the chaos, I’ve found a more confident faith. I’m not just referring to the recent reminders that Jehovah Jireh provides for all of our needs, but also to the understanding that He directs our paths in ways that don’t always make sense. What I’m learning is to trust His voice rather than letting doubt seep in through cracks chiselled by the questions of others and by my own fears. So this year, my One Word is steadfast. That word applies to so many areas of my life in which I wish to remain secure and consistent. 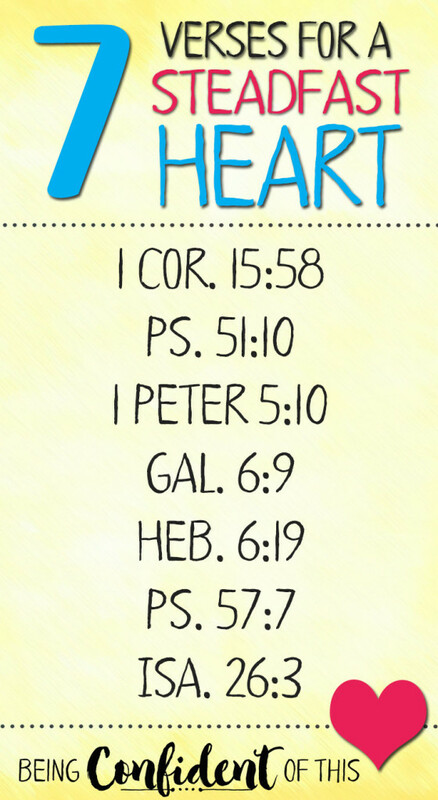 So, I’d love to share with you these verses for a steadfast heart. Over these past few years of writing and speaking, my faith journey has taken many unexpected twists and turns. As I continue to grow in Christ, I want a steadfast faith, one that remains consistent no matter what challenges life throws my way. I want to remain confident in that work-in-progress promise found in Phil. 1:6. Faithful readers will already know that my husband and I have faced significant challenges in our marriage. However, the Lord has been faithful to see us through many trials and to help us see the progress along the way. I find that I don’t panic anymore when conflicts come. I’m no longer enslaved by the enemy’s lies that our marriage will never be any different or that we might as well give up trying to change it! Being steadfast in my marriage this year means that I won’t despair during difficult seasons, but I’ll have a calm assurance that we will come out on the other side not only intact but stronger! It also means I’ll keep doing the good work of becoming a wife after God’s own heart. Being steadfast in the area of writing means I will aim to be more consistent, and that I will obey that still small voice when the Lord prompts me to sit and write. It also means that I will grow in confidence in the voice He has given me so that I don’t make comparisons or look for outside approval. My heart’s desire is to write for an audience of One. (Sigh….) Many of you know I’ve been working toward some weight-loss goals since last year. I only got rid of a little over 25 pounds, yet I persevered through injuries, illnesses, schedule changes, and the upheaval of changing ministries this past fall. This progress was only possible through the power of Christ in me! This year I’m aiming for another 50 pounds gone, an average loss of a pound a week. So, being steadfast in this area means I’ll keep plugging away at healthy eating and exercise while trusting the Lord to take care of the results. Being steadfast as a church-planter means I’ll be secure enough to be a fool for Christ, willing to take risks because my faith is firm and my identity is secure. It means I will keep doing the work the hard work, but I’ll trust Him for the results. I can also be steadfast by pushing myself beyond my own comfort zone, especially when it comes to evangelism and by trusting the Lord to continue providing for our physical needs. I want to be like the Proverbs 31 woman who does not fear the future but greets trouble with an unshakable faith (v.25). As this year progresses, I’m excited to see how the Lord continues to use the word steadfast to teach me. Will you choose to be steadfast this year? To access your free, high quality printable, simply sign up below and click Subscribe! Then, check your email to confirm your subscription. Once you’ve confirmed, look for a welcome email that will contain the link to the printable. Print it out, hang it where you will see it often. Or save it to your phone or tablet for easy access. Enjoy! 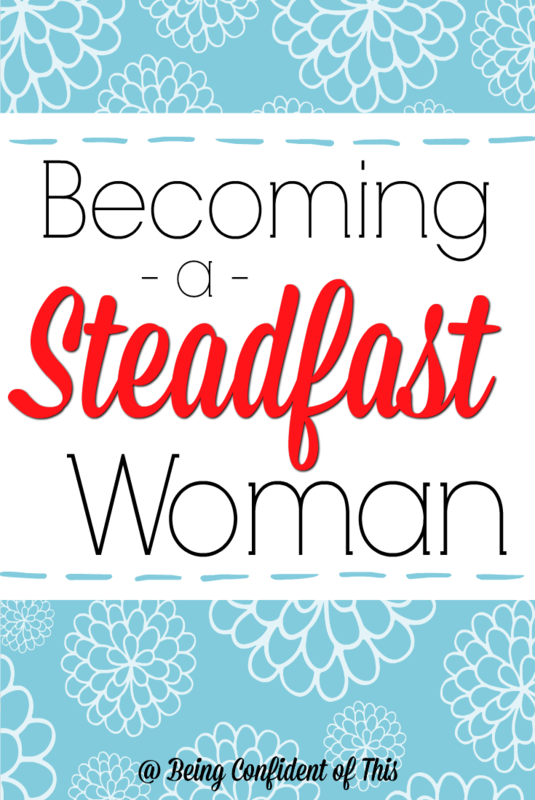 I love this … “A steadfast woman is a woman at peace.” Praying as you pursue change and consistency in the areas you mentioned here! Thank you, Dianne. I always appreciate extra prayer coverage! Steadfastness is a wonderful quality to cultivate, Jen. May the Lord shape you (and me!) in all these areas and make us more steadfast. 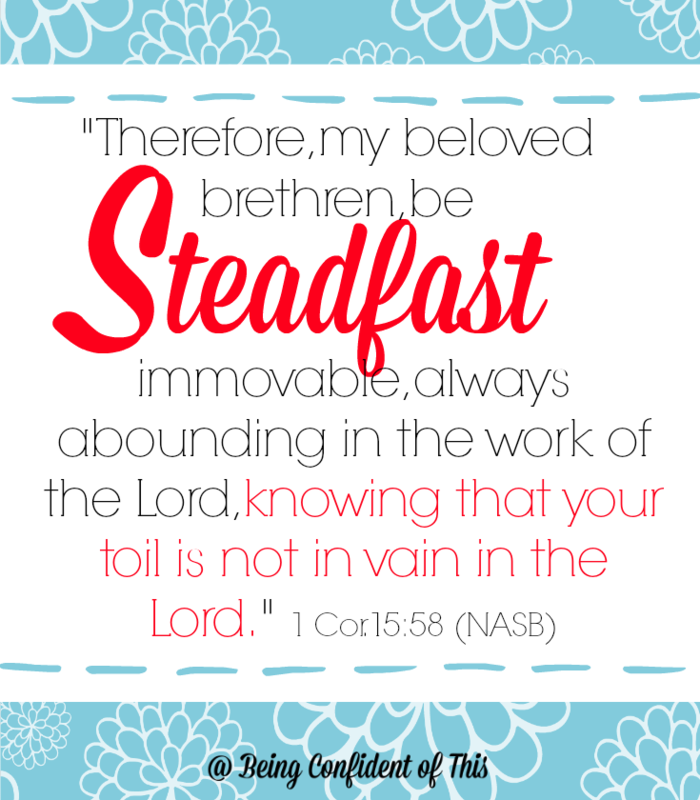 I like that 1 Corinthians verse particularly, like the idea of being steadfast to ABOUND in the Lord’s work! 25 lbs. lost is a great accomplishment, by the same, and I’m lifting a prayer for you now, and for your church plant. So glad I saw you at Jennifer’s place! Thank you, Betsy! I love that verse, too. It encourages me to keep going when I feel like giving up. 🙂 I appreciate the extra prayer, too. Thank you so much for sharing this! It’s so perfect. 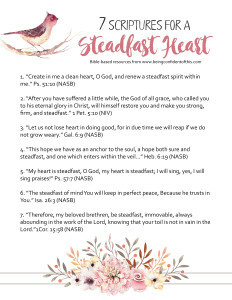 Steadfast is my word for this year also and I cannot even begin to tell you how this is the reset that I needed – the boost that I really needed! Thank you!! I’m so glad to hear it, Sharon! Steadfast is my word for 2017 also. So appreciate your words here. God bless!